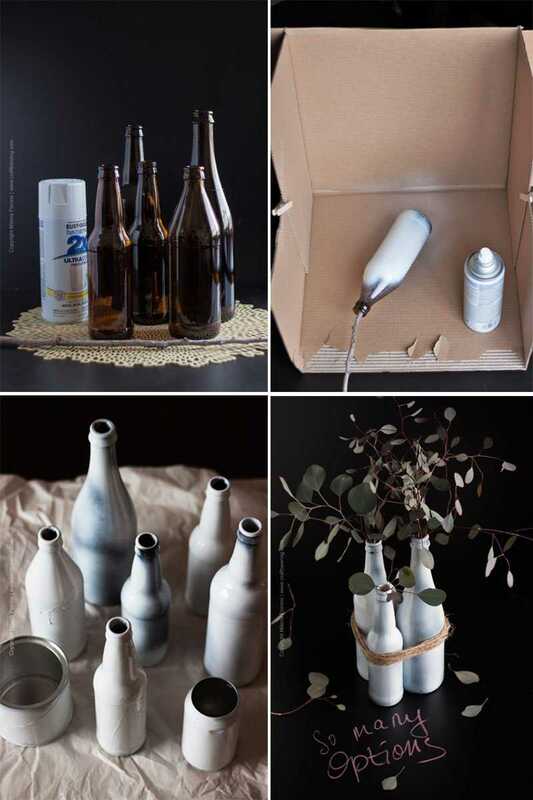 In case you were wondering, it is easier than easy to tackle this empty beer bottle craft project. It took me about five minutes of active time – the rest was watching paint dry …without the boredom connotation. I used the paint drying time to do some tax related work. It is tax season after all and the sooner we file, the better. I love the smell of actual eucalyptus leaves. It is not a potent, concentrated smell like that of the essential oil or Vick’s vapor rub. In contrast, it is fresh, invigorating and subtle. I also like to think that the eucalyptus scent is liberating and helps free one from the thought of unpleasant tasks such as income taxes. Our local Trader Joe’s sells these huge bunches of aromatic leaves and it is hard for me to resist bringing them home. Typically, I stick them inside a vase and they stay fresh for awhile. When I say huge bunches, I mean it. This week I was looking at them and thinking how cool it would be to sort of distribute them around the house, put some in the bedroom perhaps. 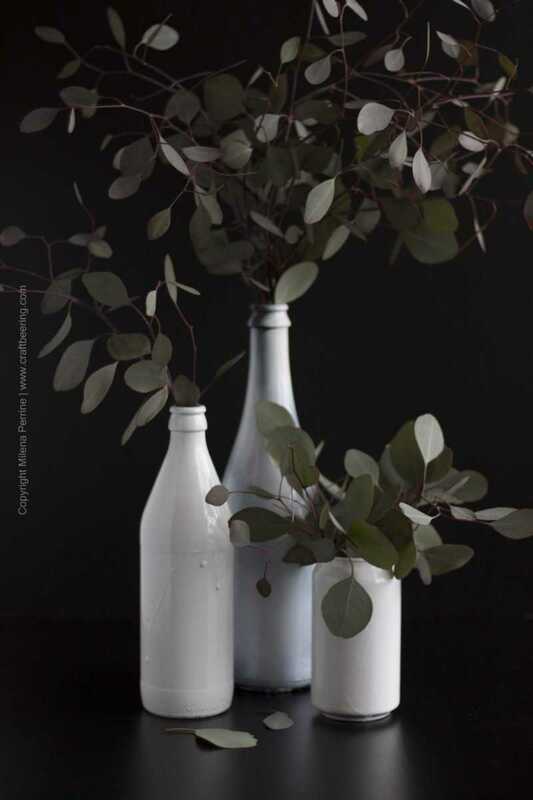 Our vase collection consists of almost identical bulky glass vases like the one in the picture above and a few decorative ones that will be somewhat surprised if not challenged by having to hold water. These are mostly wood carved and meant for dry or faux flower arrangements. At the same time, our empty craft beer bottle collection is formidable. We have certain ones from special edition brews that we want to remember. We have others – oddly sized and curiously shaped – that we just couldn’t bring ourselves to recycle. We have bottles for back up when we bottle Chris’ home brews and finally we have random bottles that we can no longer justify having. I guess we also have a slight craft beer bottle hoarding problem. A minimal one. All this made it a breeze to pick a few clean specimens for my beer bottle craft project. We had a bit of white spray paint left from resurfacing a shelf last year and I was glad it hadn’t gotten thrown away. From then it was as simple as folding a carton box to create a three sided barrier (back, right and left) to spray the chosen bottles. 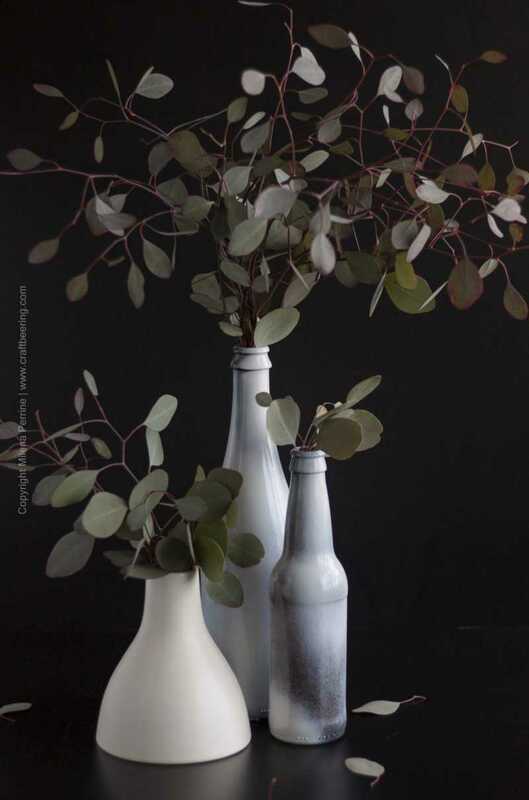 I used a fallen branch piece from a tree in our yard (you should see how capable the wind is here sometimes..) to rotate the bottles so I could cover them all around. Then I happily left them to dry and devoted myself to our tax matters. I did the de facto spray painting outside (common sense) where the light was too bright for picture taking. The photos below, taken inside, simply parallel my steps. And while I was at it, I spray painted a craft beer can and a clean peanut tin (not hoarded items:), I just didn’t recycle them). I sprayed some bottles twice without allowing them to dry, letting the excess paint drip down and create some texture. Others I sprayed very sparingly, intentionally missing some areas. The second method rendered prettier results in my opinion. Having bottles with different heights and the shorter containers allowed me to vertically tier the subsequent configurations. I also used a small white vase we had as an option, but its white was too different and I didn’t want to spray change it. 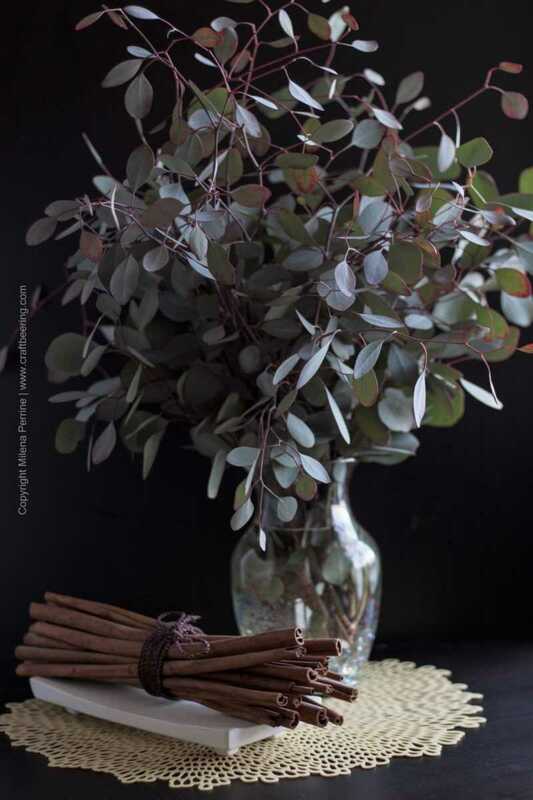 Overall, I was able to find some configurations that allowed me to break up the humongous eucalyptus leaves bunch and spread it around the house. 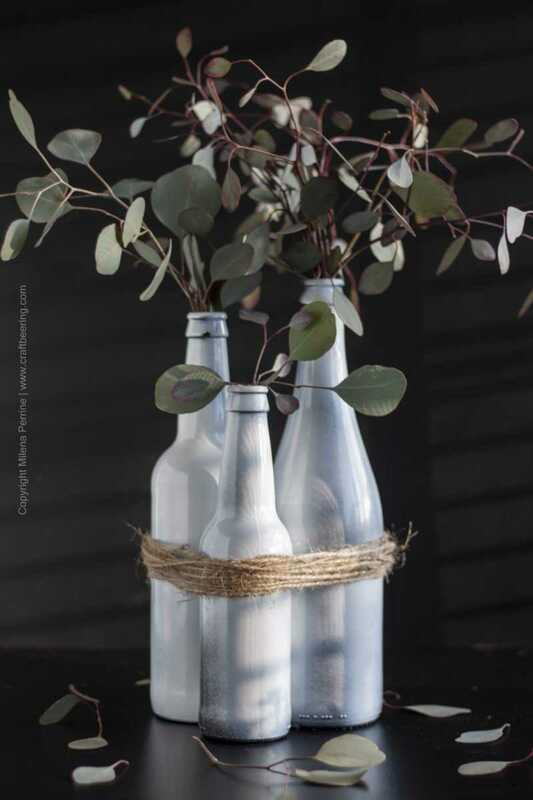 My favorite arrangement by far was making a centerpiece for our dining table by tying three bottles with jute cord. It will look good with daffodils or tulips in it later on when we bid winter good-bye. 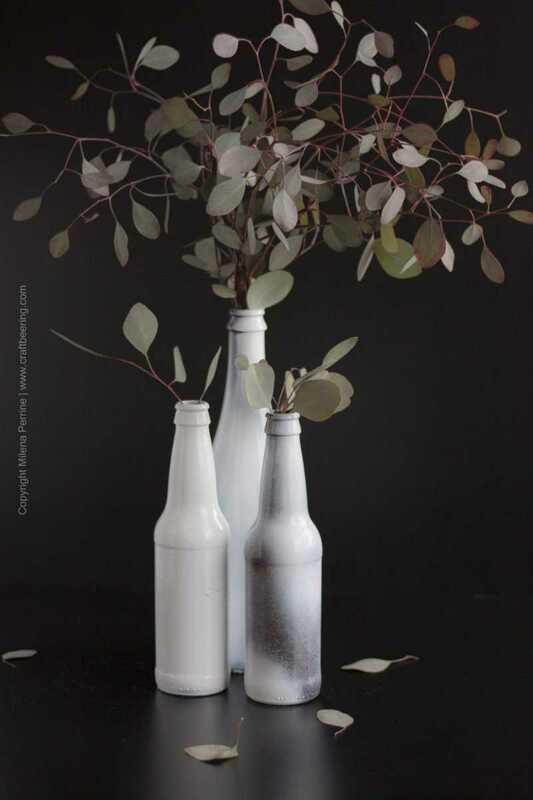 The whole beer bottle craft re-purposing was fun and didn’t take much effort at all. It pays to hoard certain things I guess:), especially when they can translate to craft beer decor.